The first hundred days of Donald Trump’s presidency have fuelled the deep feeling, on both sides, of a profound cultural difference between the United States and Europe. At the same time, new and unexpected commonalities have been created with the development of a “populist international” or an “anti-globalist alliance” on both sides of the Atlantic, the rise of anti-immigration feeling in both the US and in Europe, alongside a re-intensification of racial tensions, and questions about inclusion, exclusion, and ethnicity, in France, the Netherlands, Eastern Europe, and the US. The conference Constructing America | Defining Europe invites scholars to take these developments as a starting point to consider how the mutual perceptions of “America” and “Europe” have evolved in the twentieth century. America’s political and cultural influence has generated controversy and resistance as well as inspiring emulation and adaptation. However, since the late 1990s, the widespread perception of an “Americanization” of Europe, to which many scholars subscribed, has been replaced by a focus on cultural interaction and local appropriation. This shift in outlook, with its emphasis on the complexity and hybridity of cultural interaction has opened new areas of study. This conference follows this shift and investigates the way cultures on both sides of the northern Atlantic perceived, represented, interacted with, and changed each other. It does so by drawing attention to cultural perceptions and to the overarching patterns, domestic functions, and geopolitical contexts of those constructions. We also welcome contributions that compare transatlantic connections with perceptions from other parts of the world, offering a comparative global perspective. We invite scholars to examine how understandings of European culture, and American culture, have been formed, have influenced each other, and how references to America and Europe have circulated transnationally. How have groups involved in transatlantic exchanges innovated cultural practices or identities by adapting or rejecting features attributed to the other? How have such transnational exchanges and relations created hybrid identities, cultural objects, structures, institutions? We welcome contributions from the fields of American studies, cultural history, transatlantic studies, and interdisciplinary approaches, applying concepts such as reference cultures, transnationality, entangled history, and cultural transfer. These examinations will build a richer understanding of the long history of the relationship(s) between America and Europe in the twentieth century, and of how that relationship has evolved in a globalized and globalizing century. Mass Media and Popular Culture: From the banning of German-American newspapers during WWI to the “Jazz invasion” of Europe in the 1920s and the “British invasion” of the US in the 1960s, popular culture – and the way it was disseminated – has always been a contentious field of transatlantic relations. Which role did perceptions of the transatlantic other play in contemporary debates about popular culture? How has the development of modern mass media, from tabloid newspapers to the internet, changed the mutual perceptions of Europe and America? How did these perceptions influence the development of media technologies themselves? How did they shape the evolution of formats and genres, such as soap operas, romantic comedies, news, or reality tv? How have new and interactive modes of viewing and consumer selection (Netflix, live tweeting, and binge-watching) become part of a transnational cultural exchange and how have they shaped perceptions of America and Europe in popular culture? What are the historical continuities and discontinuities in these cultural exchanges and developments? Economics and Society: From the beginnings of the modern welfare state to the neoliberal reconstruction of Eastern Europe after 1989, both ideal and negative images of “Europe” and “America” have sparked vigorous debates about economics and society. How did the rise of welfare politics during the twentieth century influence mutual perceptions on both sides of the Atlantic? To what extent did America and Europe serve as a utopia or dystopia in debates about public policy issues such as health care, race, drugs policy, and social welfare? How did changes in the economy – for example, periods of high unemployment, stock market fluctuations, technology booms and busts, and the outsourcing of jobs – interact with cultural exchanges and perceptions? Politics and Policy: The concept and practice of American democracy, rooted in European Enlightenment debates but strongly identified with consumerism and populist appropriation, has simultaneously been perceived as appealing and fragile. This has resulted in strongly divergent assessments of its civic culture and political institutions. How have perceptions of American democratic virtues and pitfalls influenced debates about democracy and citizenship in Europe? How have they been perceived, received and transformed in transnational engagements? Which role did the image of “Europe” play in the development of American political culture? These questions are all the more pressing in light of recent political developments, such as the rise of populism, reactions to the European refugee crisis, and claims of outside interference in national elections. Scholars are invited to engage with these issues as they develop their submissions for this conference. Confirmed keynote speakers include Mary Nolan and Thomas Bender. Limited funding is available to subsidize the travel and accommodations of those presenting at the conference. We plan to publish selected papers as an edited volume or special issue of a journal. Please send a 300 word abstract and a 2-page CV to constructingamerica@uu.nl, by 12 May 2017. 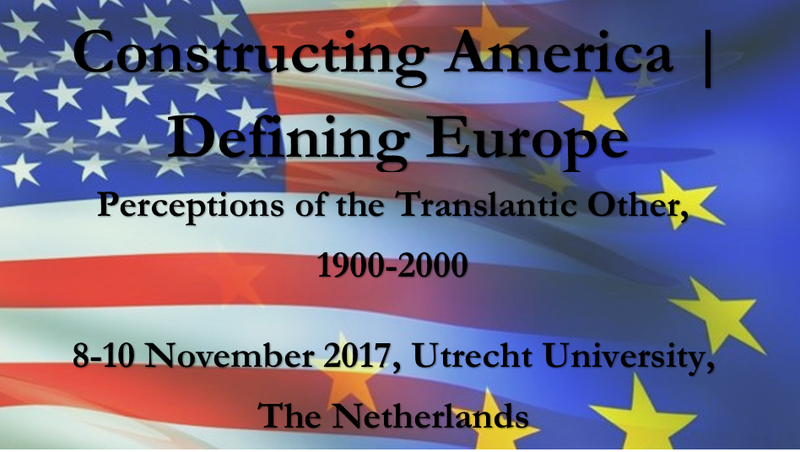 If you have any questions, please contact Jaap Verheul at j.verheul@uu.nl, Jochen Hung at j.b.hung@uu.nl or Rachel Gillett at r.a.gillett@uu.nl and include “Constructing America, Defining Europe” in the subject line. Authors of accepted proposals will be contacted by 1 July 2017.